A crucial moment in the unfolding events in Egypt occurred when the crowds of protestors tried to cross the Kasr al-Nil Bridge in Cairo tried to reach Liberation Square by crossing this bridge. Riot police kept them at bay by using gas, water canons, and truncheons. The situation is described in this NYTimes article. The battle between the protesters and the police ebbed and flowed for more than 6 hours. What does this have to do with fluid mechanics? A lot--as you can see in the picture, a large number of people are trying to squeeze from the streets into the confined space on the bridge. There is a law in fluid mechanics called "conservation of mass." In the broad street or park approaching the bridge, the number of people moving toward the bridge is given by their density times their forward velocity. You can think of it as the number of "lanes" of people moving forward times the velocity that they are moving in the lanes. On the bridge, the same law applies, but the number of lanes is greatly reduced. For a steady state, the flux of people has to be the same, which means that the people on the bridge should be moving much faster than the ones approaching the bridge. 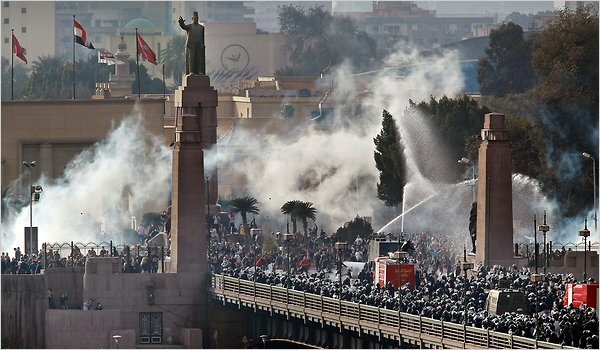 Of course, this can't happen in a crowd, and so the bridge gets jammed--even without riot police at the far end. This situation occurs all of the time in traffic jams when the road narrows. The problem is that any slight event can cause the jam to turn into a stampede, with injuries and deaths. I was amazed, and relieved, that this seemed not to happen in Cairo. Just a few weeks ago at least 104 pilgrims were killed and another 50 injured in a stampede of pilgrims in India. Stampedes have killed people in a wide variety of venues--synagogues, theaters, meeting halls, train stations, air raid shelters, stadiums and, yes, Walmart (November 28, 2008). And yes, this does relate to fluid mechanics--one model for traffic flow is based in river hydraulics! The current floods in Queensland, Australia, are another in the extremes of fire and water that hit Australia (earlier post here). Cyclone Tracy struck Darwin, Australia, on Christmas Eve and Christmas Day, 1974. It killed 71 people, destroyed over 70% of the buildings in Darwin, left another 20,000-25,000 people homeless, and caused over $800 Australian 1974 dollars damage. It spurred a priority to develop cyclone-proof buildings. Many of the survivors were evacuated to other towns and never returned to Darwin. 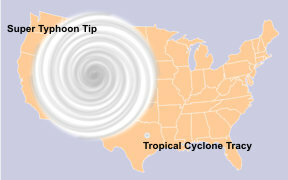 The storm was an unusually compact cyclone, with gale-force winds extending less than 50 km from the center; the graphic on the right shows the relative sizes of Tracy (look hard for the small dot in the middle of Texas, right above the T in Tropical) and Super Typhoon Tip. There's a good Wiki article on Cyclone Tracy here, so I'll not repeat the info. Relative typhoon sizes. Public domain, NOAA. The event was so traumatic for Australians that it made it into the popular media. Here's a link to a song describing the effects, sung by Bill (Cate) and Boyd (Robinson). It was a fund-raiser for the reconstruction effort. Sometimes a scientific explanation can't compete! A California surfer was caught in this big wave at Mavericks surfing area near Half Moon Bay, California. 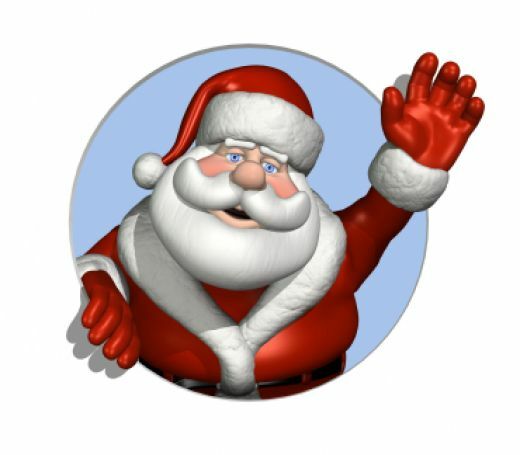 He is in critical condition at Stanford Medical Center. 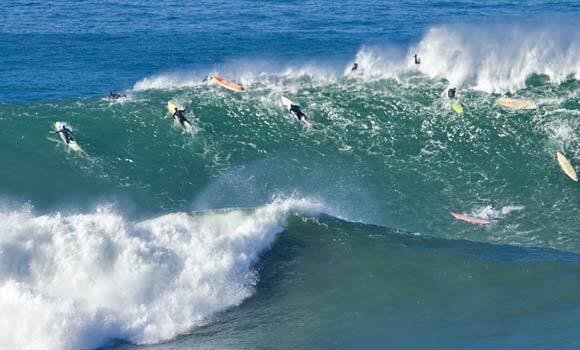 Half Moon Bay is famous for its big, and dangerous, surf. On February 13, 2010, spectators crowded onto a narrow beach were hit by a wave estimated to be 50' in height. This wave was apparently caused by a combination of high tides and high surf. 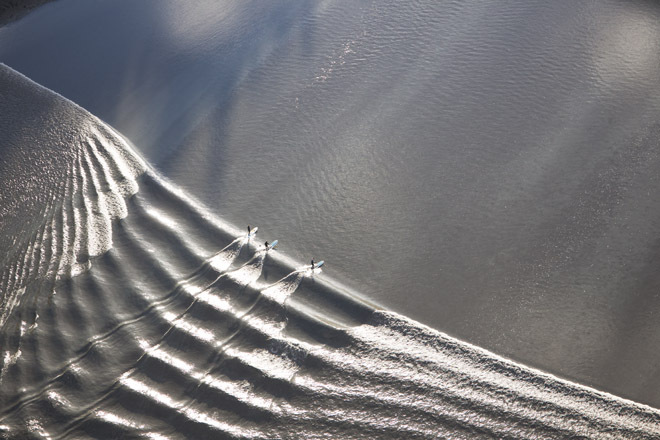 When the waves exceed 20' height, there is a contest held on short notice, with $150,000 prize money for competitors. Just the day before the accident this weekend, the waves had been declared close, but not at, the 20' height. There is a web site dedicated to updating surfers on conditions here. What causes such big waves in Half Moon Bay? A combination of three factors: the waves generated by winter storms in the Pacific Ocean, the geology of the bay itself, and the complex topography of the underwater ocean bottom. The geology of the area was described in 1965, by Warren Yasso who published an article in the Journal of Geology titled "Plan Geometry of Headland-Bay Beaches" (J. Geol. , v. 73 (5), pp. 702-714). A "headland bay" lies in the lee of a headland (obstruction) that causes waves to refract (bend) around it. The headland at Half Moon Bay is Pillar Point. The beach formed in these settings has a characteristic concave shape that is caused by refraction, diffraction, and reflection of waves into the shadow zone of the headland. To a good approximation, the concave shape of these beaches is given by a logarithmic spiral. Half Moon Bay beach joins the beaches at Sandy Hook, NJ, and Drakes Beach and Limantour Spit along the Drakes Bay area, CA, in having this shape. The sea floor under this region is contorted because of the active tectonics and faulting that have occurred in this part of California. On the map above, dark blue is deep; red is shallow. The center of the box is "Sail Rock", and the tan area to the northeast of it is Pillar point. The waves break in the area in the black box. The dominant wave direction through most of the year is from the northwest, and these waves do not generate large surf. However, sometimes during the winter, the strong storms in the north Pacific generate waves that come in from the west. When they hit the shallow water at Sail Rock, they break over the bedrock reef just to the east of Sail Rock. See here for more discussion, and an animation of the underwater topography. To see a very different, and much gentler, surf posting on this blog, click here! Samantha Stewart, a Canadian woman, has become an internet hit with her experiment tossing boiling water into the frigid air of Saskatchewan (video)! This is a popular activity, here being done at Mount Washington in 2007. These features provide a chance to talk about my very favorite phase diagram! Which is NOT the pressure-temperature diagram that we all learned in high-school and college (right diagram). Here's an example of why the P-T diagram isn't helpful: Imagine that you have liquid water at P and T somewhere in the green field on this diagram, and that you lower the pressure while keeping temperature constant. This would be a vertical path on the P-T diagram--for example, draw a vertical line down the 80 C mark. The pressure changes continuously and, after the red line is crossed, all of the liquid water has turned to vapor. But, a lot happens when your path crosses the red line--the liquid water boils. Initially, just a few bubbles of vapor form, but the pressure and temperature can't change until all of the liquid has turned to vapor. You are "stuck" on the red line until that happens. T-S diagram for H2O: Excuse my lack of graphics skills! 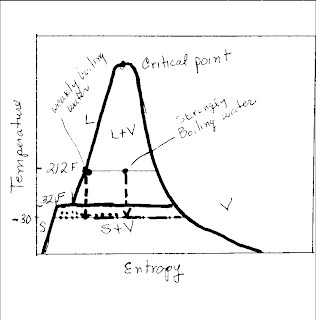 In fluid dynamics, it's common to use a plot of temperature vs. entropy (T-S, left graph), which gives much more information about the state of a system for many problems in flow and thermodynamics. On this diagram, you not only have the solid (ice) =S, liquid=L, and vapor =V) phases that you see on the P-T diagram, but you have the mixed phases: liquid + vapor (= boiling water or an aerosol, depending on the proportions of liquid and vapor) and solid+vapor (bubbly ice or snow). (Be careful, this diagram is only relevant to a pure H2O system, so you can't directly link it to snow in our atmosphere of nitrogen and other gases.) In the mixed phase regions, the horizontal lines are constant pressure, "isobars." When processes happen very rapidly, they are adiabatic (meaning that no heat is transferred into or out of the system) and reversible. 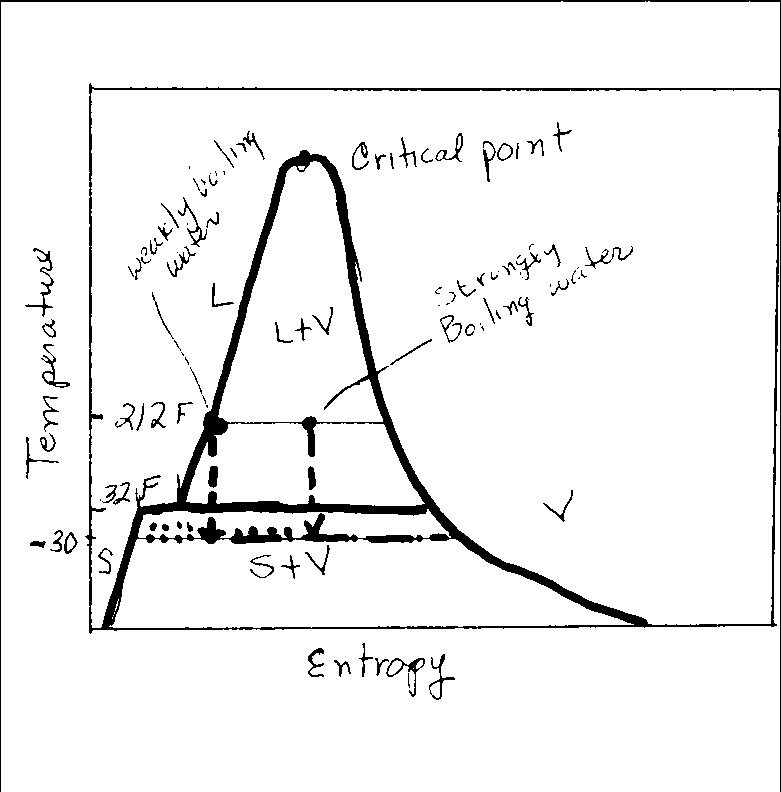 Reversible processes have constant entropy, and so are represented by a vertical line in the T-S diagram. I've illustrated two processes with the dashed vertical lines. The dashed line with an arrow on the right is decompression of a cup of barely boiling water; the one on the left follows the decompression of strongly boiling water. Both processes start at 212 F and end at -30 F, conditions reported for the Canadian and Mount Washington experiments. They start at 1 bar pressure (the horizontal line) and end at a very low vapor pressure, a fraction of a millibar. The amount of vapor formed is given by the "lever rule": it is the ratio of the dotted segment of the horizontal line to the total length. You can see that if you approximate the "water tossing" as an adiabatic, isentropic experiment, it ends up as a mixture of cold vapor, and ice crystals (the snow). There is much more vapor when strongly boiling water is tossed than when weakly boiling (or not even boiling at all) water is tossed, as you can see by the ratios of the arms in the lever rule. Presumably, the vapor that exists in boiling water expands and breaks the liquid water into small drops which crystallize rapidly to snow. In theory and in equilibrium, vapor is formed even if the water initially has none, but equilibrium conditions may not be obtained in such rapid processes, so this may explain the observations on the video that cold water doesn't work as well as the very hot water. Why does natural gas explode? 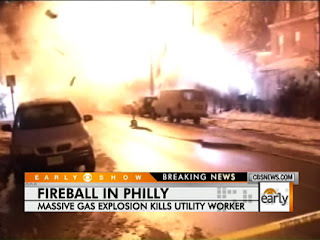 Last night there was a terrible gas line explosion in Philadelphia, captured on screen by a bystander (see video here). The line was apparently being repaired when the explosion occurred. One worker was killed and three others are in critical condition. Natural gas is comprised mostly of methane, CH4, with up to 20% other hydrocarbons such as ethane, C2H6. Methane is notorious for causing explosions, and I covered some of the physics of explosion in a previous post. Gases are flammable only under certain conditions. The "lower explosive limit (LEL)" is the composition of a mixture (with oxygen in most cases) that contains the smallest amount of methane possible for combustion, and the "upper explosive limit (UEL)" contains the highest. Below and above these limits there is either too little methane (LEL), or too little oxygen (above the UEL). There is a quantitative difference between the flammability limit and the explosive limit, but for all practical purposes these terms can be used interchangeably. There are two types of combustion: deflagration, when the combustion zone (where reactions are taking place) travels at a velocity less than the speed of sound in the unreacted mixture, and detonation, where the combusion zone travels at a velocity greater than the speed of sound in the unreacted mixture. An explosion occurs when the container in which the reaction takes place bursts. Control of the gas and vapor concentrations is a major issue in occupational safety and health. The Saidmareh landslide in Iran. Geology.com is a great source of information for this blogger, and the image from the right, originally from NASA is from that site; it was also featured on Dave Petley's landslide site in 2009. This landslide, which occurred about 10,000 years ago, is believed to be the largest yet identified on the surface of the earth. About 20 cubic kilometers of limestone slid 1600 meters (a mile) vertically, spread across the Karkheh River and its valley. Some material traveled 14 kilometers. 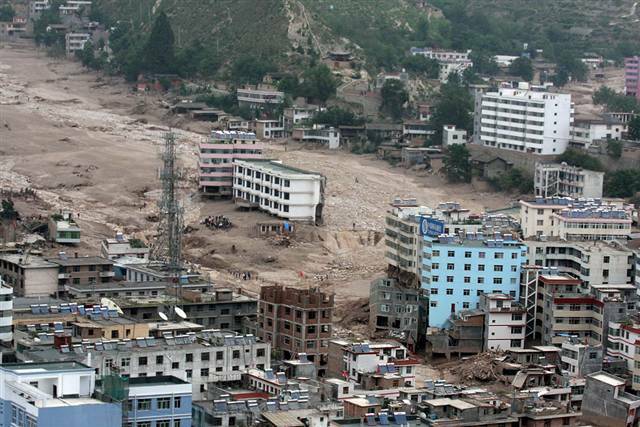 The slide dammed the Karkheh River, causing a landslide lake to form behind the earthen dam. This lake eventually breached the dam. Massive landslides are often triggered by earthquakes. In the U.S., one of the most catastrophic occurred in 1959 in southwestern Montana. 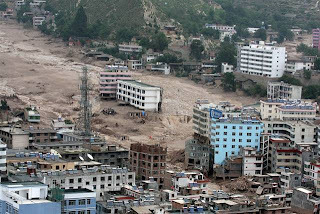 An earthquake, M 7.3-7.5, caused a huge landslide that killed 28 people and cost $11 million 1959 USD in damage. 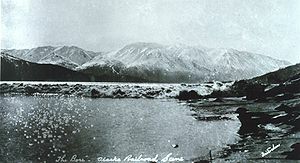 This slide blocked the Madison River, resulting in the creation of Quake Lake. The earthquake is known as the Hebgen Lake earthquake. Fearing that the lake would burst through the dam in a catastrophic flood, the Army Corps of Engineers almost immediately began to cut a channel into the slide, and within a month, water was flowing through this cut. In contrast, the landslide dam blocking the Karkheh River in Iran lasted long enough that 150 meters of sediment accumulated at the bottom of the lake before the dam failed. Landslides that travel long distances occur not only on Earth, but also on Venus, Mars, and Io. The conditions that permit such large, heavy masses to travel long distances have been, and are still, subjects of controversy. The runouts exceed distances calculated from simple models in which friction is a retarding force. 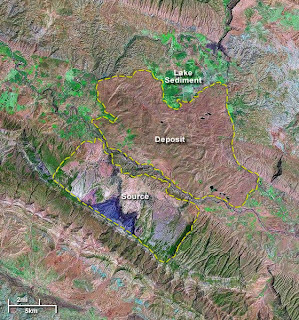 One hypothesis, based on field observations of the base of the Blackhawk Landslide in California, is that there is a cushion of air that lubricates the base of the landslide. Another suggestion is that internal vibrations could "fluidize" the rock debris, making the effective coefficient of friction much lower than would be characteristic of a sliding solid mass. Within the U.S., the Heart Mountain landslide in northwestern Wyoming has a runout distance of about 50 km. How it traveled so far has been a source of scientific controversy for decades. In a recent paper, Goren et al. have proposed that a feedback between "shear heating, thermal pressurization, and thermal decomposition of carbonates" at the sliding interface accounts for the large runout distance. 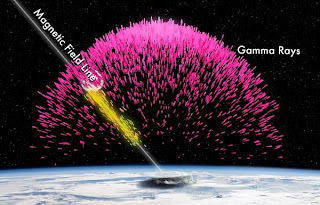 The model suggests that the sliding velocity was a few tens of meters per second to more than 100 m/s, and that it took only a few tens of minutes for the whole sliding event. More than 375 people are reported dead in floods and landslides in Brazil (note added on 1/17/11: over 600 deaths now reported). A million are reported homeless due to floods in Sri Lanka. 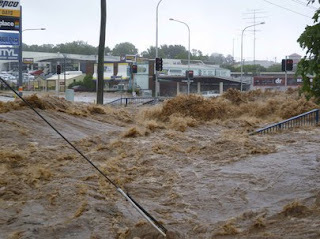 Major floods have been occurring in Australia, building up for several months and culminating last night with the flooding of Brisbane, Australia's third-largest city. In spite of individual stories of courage and heroism, there have been at least 34 deaths there. The National Post in Canada reports "Horrific picture emerges of Australia flash floods", and that Brisbane resembled a "war zone" as the flood hit 30,000 properties. And it's either drought or plenty." The whole ballad is sung on this video. A discussion of the role of La Nina and the North Atlantic Oscillation in these weather events is here. Although there is much speculation on the WWW about the role or implications of these events and climate change, there are also lessons to be learned by looking back 150 years at the history of this part of Queensland. It is tragically like many, many other places in the world where humans have altered their landscapes. I excerpt the following history from this reference. For more than a century, the Queensland government had a vision, and determination, to introduce farming into this region. Australian history in the 1800's is complex. Queensland became an independent state in 1850, with a complex history of replacing pastoralism with farming and dairying--dairying being needed to sustain the farmers until crops were sold, or in case they failed. In the 1887 a Department of Agriculture was established in Queensland, and by World War One, the region around Toowoomba was exporting grain. In order to meet the demand for fencing, an enormous number of trees were felled, depleting the forest resource. Reserves and parks were established in the headwaters, but tree-clearing and increasing stock numbers caused erosion on ridges and compaction of vegetation on floodplains. In the 1870's and 180's, residents of Toowoomba changed the forest into orchards, which caused the water table to rise and swamps to developed. Drainage became a problem, and mixing of raw sewage and groundwater wells resulted in a series of typhoid epidemics in the 1870's and 1880's. This was corrected by civil engineering and introduction of sewage systems. However, as has been observed around the world, the replacement of vegetation with urban roads and buildings increased the rate of runoff to the main river channels. Flash flooding became a common experience in the main towns. Thus, more than a century of history preceded the tragedy of this week. More on flash flood dynamics in a later post. Today a major storm is pounding the southeastern part of the U.S. A major concern is that the abnormally cold temperatures that will persist through Tuesday will cause formation of ice and freezing rain that will bring down the power lines. 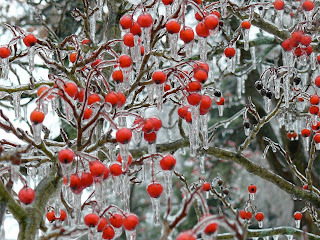 Freezing rain is a hazard in the mid-latitude regions of the globe. Although major freezing rainstorms are relatively rare, they are amongst the most costly of hydrometeorological disasters. The Ice Storm of January 5-9, 1998 in Quebec and Ontario caused 25 deaths, left a million householders without power, caused nearly $US 3 billion in damages, and another $US 3 billion in short-term lost economic output and insurance claims. Some climate change scenarios predict that with warming, the amount of freezing rain will increase. For example, study of possible changes in south-central Canada during the winter predicts an increase of 85%, 60%, and 40% in northern Ontario, eastern Ontario (including Montreal, Quebec), and southern Ontario, respectively (Cheng, C.S. et al., Natural Hazards Earth System Science, 7, 71-87, 2007). 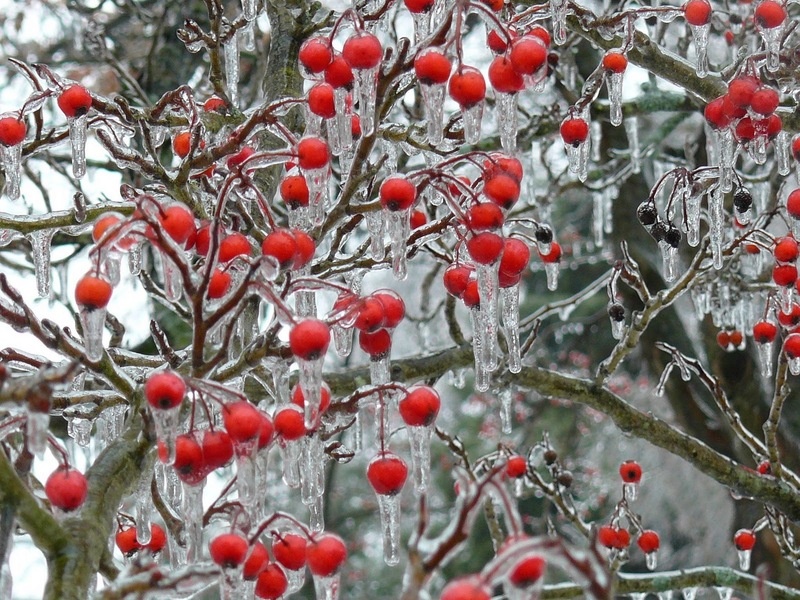 What is freezing rain? Under certain atmospheric conditions, raindrops become supercooled (cooled below the freezing point without turning to ice) while passing through a sub-freezing layer of air, and then freeze upon impact with cold objects on the surface. 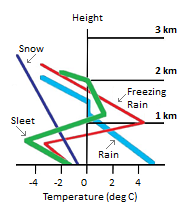 The figure to the right shows conditions under which freezing rain occurs, and contrasts these conditions with those that produce snow, sleet and rain. Freezing rain is a particular hazard to aircraft because it can add a significant amount of weight to a plane, and can resculpt the contours of the wings. If an aircraft starts to accumulate freezing rain in flight, the safe and easy maneuver is to descend into warmer parts of the atmosphere. However, the conditions that produce freezing rain near the surface are such that the plane must climb to higher elevations to find warm air, a much more difficult maneuver if the plane has started to ice up. In 1994, American Eagle Flight 4184 was in a holding pattern 65 miles southeast of Chicago's O'Hare airport. Ice formed on the upper surface of its wings, causing the autopilot to disconnect and the pilots to lose control. The plane crashed into a field, killing all 68 passengers and crew. As a result of this accident, the airplane type (an ATR) was removed from service in most northern hubs prone to icing conditions, and pilot operating procedures in icing conditions were substantially revised, including non-use of the autopilot under icing conditions. China's stealth jet: How does it tie in to geology? !! 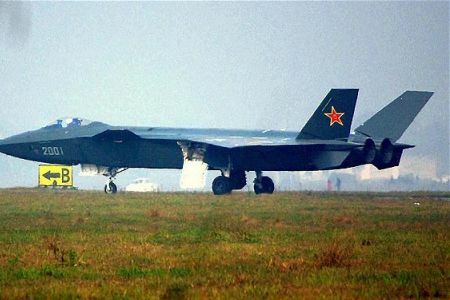 The purported Chinese stealth jet, J-20. Source of photo unknown. News has been circulating on the WWW that China has tested a prototype stealth jet. "Stealth" refers to a complex set of technologies used to make these jets relatively invisible to detection, not many of which are relevant to geologic processes! However, it is being said that the Chinese aircraft resembles the US F-22 supersonic jet, and supersonic flows are relevant to geology. June 22, 2009 in the Gulf of Alaska. 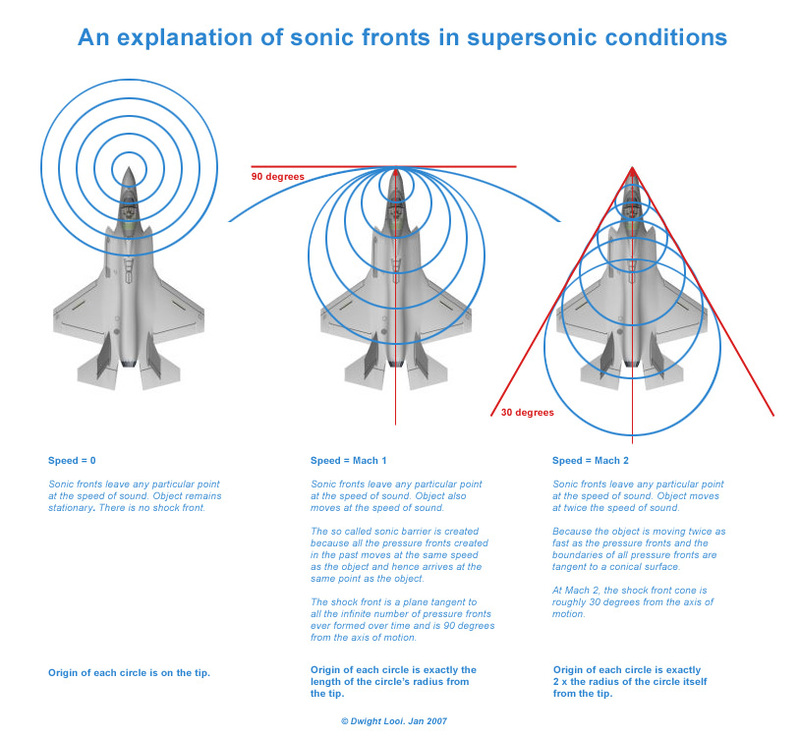 The F-22 is a supersonic aircraft (good Wiki summary here). Its roots date back to 1981 when the USAF developed a requirement for a new and superior fighter to replace the F-15 series. The production model was unveiled in April, 1997 and it first flew in September of that year. There is a contract to Lockheed Martin for 183 jets by the end of 2011. Export of this plane is banned.Supersonic aircraft travel at Mach 1 or higher speeds. The Mach number is the ratio of the speed of the aircraft to the speed of sound in the medium through which it is flying, in this case, air. At room temperature, the speed of sound in air is about 343 m/s (about 760 miles per hour)--at high altitudes where it is colder, the sound speed would be slightly lower because it depends on the square root of the temperature. When an aircraft is flying at speeds much less than the speed of sound, it creates disturbances that spread out in all directions, like ripples on a pond. 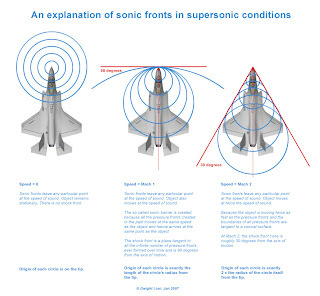 The picture on the left of the graph on the left shows a limiting case when the jet is not moving at all. As the speed of the aircraft increases, the circles become distorted into ellipses, stretched away from the direction of motion, as shown in the middle picture. When the jet reaches Mach 1, no disturbances radiate out in front of the aircraft--one major factor in making it stealthy. No one on the ground hears it until it is "too late". As the aircraft accelerates beyond Mach 1 (some aircraft can attain Mach 3-4) the circles of disturbance coalesce to form shock waves that stream off the nose and wings of the craft. When you are on the ground and hear a "sonic boom", these shocks are sweeping across you. 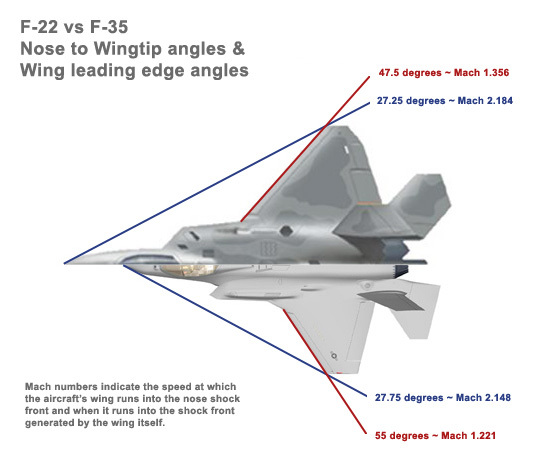 The illustration on the right shows the nose and wing shocks from an F-22. For stability, the craft cannot fly above speeds that would cause the shock from the nose to intersect the wings. 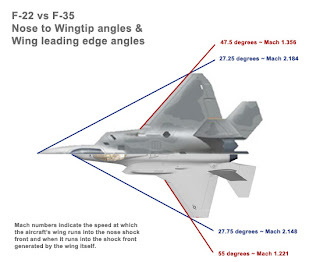 The shocks from the wing have a different shape than those from the nose because the angle of the wing is different than the angle of the nose, as illustrated in the graph on the right. How does this tie into geology? Some fluids, such as boiling water, bubbly magma, and dusty gases have very low sound speeds (here's a pdf of a paper that I published on this phenomenon). The sound speed of boiling water can be as low as a few meters per second--this means that a fast track athlete could potentially run at speeds greater than Mach 1 if immersed in boiling water! 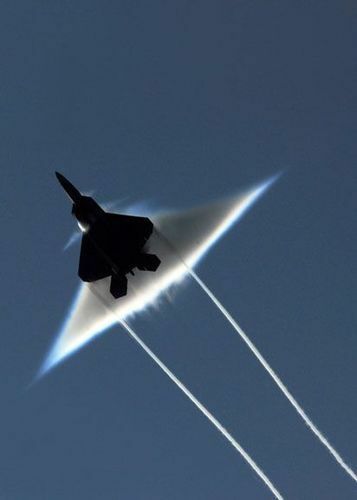 Shock waves would be streaming off that runner like those in the photo above of the F-22! Another way to envision the aircraft is from the pilot's view: he's not moving, but air is moving past him at Mach 1,2,3 or 4. The same applies to geologic situations. Imagine that a fluid that has a low sound speed is flowing past an obstacle--a rock or a ridge, for example. Shock waves will be generated around this obstacle that make the flow field very different from that created by low speed, subsonic fluids. This fact has been under appreciated in general in the geologic community, and only over the past few decades have studies begun that include the possibility of supersonic flows. 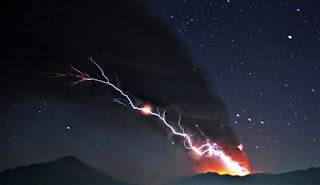 I discussed one observation of shock waves earlier on this blog here. 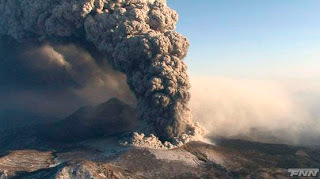 Shock waves were observed by a number of people during the eruption at Eyjafjallajokul earlier this summer, for example, this You-Tube video.